Why pain persists well after a nerve injury has taken place remains a key question for pain researchers. The enduring aspect of chronic pain suggests that lasting changes in the cells involved in pain signaling might contribute to this process, but the nature of these changes has remained unclear. Now, new research shows that long-term alterations in the “epigenome”—the set of chemical modifications to DNA that regulates gene expression—may keep microglia “primed” for subsequent pain. 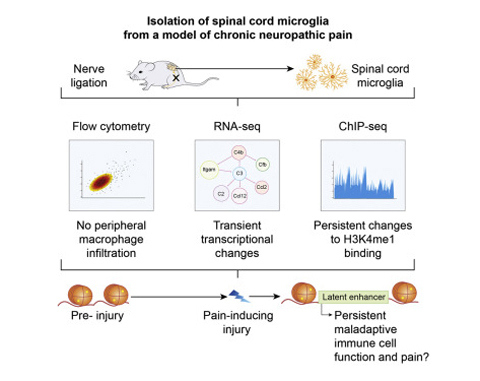 First author Franziska Denk and senior author Stephen McMahon, King’s College London, UK, and colleagues now show that spinal cord microglia, essential players in neuropathic pain (see PRF related news story), carry molecular footprints of nerve injury for almost a month after spinal nerve ligation (SNL), a model of neuropathic pain, in mice. These footprints consisted of a single methyl group added to histones (the proteins around which DNA wraps) at regulatory regions of DNA called enhancers; enhancers, through effects on gene transcription, are known to influence gene expression over time scales as long as a cell’s lifetime (see PRF related webinar). These changes identified in the study persisted even after early increases in the expression of more than a dozen genes following nerve injury returned to normal levels. “For the first time, the authors have identified injury-induced, long-lasting changes in the epigenome,” in a model of chronic pain, wrote Sandrine Géranton, University College London, UK, in an email to PRF. “This finding could certainly be a key mechanism for priming microglia reactivity.” But it’s still unclear if or how these long-term alterations in the epigenome might maintain chronic pain. “That most transcriptional changes are back to normal would suggest that the genes regulated by these enhancers might not contribute to the maintenance of the pain state,” added Géranton. The findings were published online May 12 in Cell Reports. Injuries can lead to chronic pain; however, “we don’t have a very clear mechanistic understanding in the pain community about why pain should be chronic at all,” said Denk. In their search for a possible explanation, the authors borrowed an idea from the field of immunology. While most enhancers in cells are set during development, inflammatory signals were recently shown to spur the emergence of new “latent” enhancers in macrophages, a type of immune cell (Ostuni et al., 2013). Researchers think that these latent enhancers, which can be identified by increased histone methylation, may allow for adaptive immunity. Denk and colleagues considered whether similar marks might be present in latent enhancer regions of microglia, the resident macrophages of the central nervous system, and if so, whether they could represent a kind of memory of an initial injury. To explore this idea, the authors first characterized the immune response in the spinal cord a week after SNL or sham surgery in mice. Cells isolated from the spinal cord were stained for markers of microglia, and for peripheral immune cells—infiltrating macrophages, neutrophils, T cells, and B cells—which were then counted using flow cytometry. The group found that in samples from both SNL and sham mice, the majority of immune cells were microglia, with only low levels of the other types. Interestingly, this finding contrasted with previous literature suggesting that peripheral immune cells do infiltrate the spinal cord after nerve injury (Echeverry et al., 2011). Next, the researchers profiled gene expression across the genome of the microglia. By sequencing messenger RNA (mRNA) pooled from the lumbar segment of the spinal cord one week after SNL or sham surgery, they found significantly increased expression of 17 genes in samples from SNL mice compared to sham animals, including a number involved in microglial activation and the immune response. Using Western blot and flow cytometry, they confirmed that these increases in gene expression were accompanied by increases in protein levels. Together, the results showed that nerve injury changed microglial gene expression. The authors then showed that the epigenome of the microglia was altered, too, by examining genomewide changes at enhancers in isolated cells. They performed chromatin immunoprecipitation (ChIP) using an antibody to identify a chromatin modification called H3K4me1, characterized by the presence of a single methyl group at a specific lysine residue of a particular histone; this modification is thought to serve as a measure of the locations of enhancers. With this approach, the group identified 36 putative latent enhancers that emerged after SNL but not sham surgery. Moreover, 40 percent of these sites were close to genes with high levels of expression after SNL, suggesting that they were indeed enhancers. The researchers also went on to replicate their findings for eight out of nine selected enhancer sites in two other groups of injured mice and sham controls. Hence, nerve injury appeared to reliably reshape the epigenome of microglia. There are other caveats as well. For instance, stretches of DNA exhibiting the methylation mark are not necessarily enhancers, though most enhancers have been found to contain the mark (Heinz et al., 2015). Still, the new work is an important first step to understanding the role of the epigenome in chronic pain. “I see our study as a proof of principle—that you can have long-lasting epigenomic changes as a result of a chronic pain state,” said Denk. Persistent Alterations in Microglial Enhancers in a Model of Chronic Pain. Cell Rep. 2016 May 24; 15(8):1771-1781. Epub 2016 May 12.